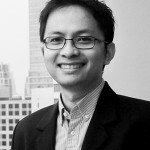 Adjie graduated as Bachelor of Architecture from Bandung Institute of Technology, Indonesia in 2002 and Master of Arts in Urban Design from National University Singapore in 2010. He began his professional career by working for Rekamatra and PDW Architects in Jakarta. Later he moved to Singapore and worked for DP Architects and SMC ALSOP currently known as SPARCH. As an architect, he was involved in wide range of architectural and urban projects which have been implemented around the world. His extensive experience in mixed-use and urban project also includes designing several international high profile projects such as Arzanah Masterplan and Rihan Heights Development in Abu Dhabi, UAE. Since 2003, he has won several architectural design competitions in Indonesia, Vietnam, and Singapore. In 2011, together with Yonav and Ajiv, he established PT KIND Indonesia.